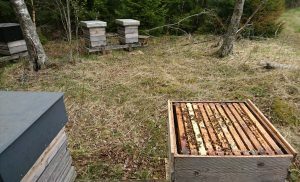 This entry was posted in Breeding, Disease resistance, Management, Overwintering, Spring and tagged feeding bees, locally adapted bees, spring increase by Erik. Bookmark the permalink. Wow ! What challenges you have, and such dedication! I will be interested to see what you discover. I am a relatively new beekeeper, we have always rented bees for our kiwi pollination until I decided to start keeping our own bees 5 years ago. One of my challenges is dampness. This winter we had so much rain, (very needed). I am told that bees can handle cold and dry, but not cold and wet very well. We do freeze here and for those colonies that shrunk down to 1 box for winter, I did insulate them and I think it helped. That may not be practical for a beekeeper with a lot of hives. I started with purchasing NUCs from a local treatment free beekeeper that had established his stock from over 10 years. For the last 2 years, I have caught swarms. The combination of those 2 sources seems to be doing well. Keep writing about your experiences and challenges. Very interesting to read. Forgot to mention, we are in Aptos, California. We have a small facebook page at APTOS FARM. Lovely animals on your farm! You are doing well and your bees are back to normal, concerning Varroa. That is they are of no concern. This year it seems I will be almost in the same position. It’s lovely to concentrate on just keeping bees and doing normal beekeeping as it was before the mite, some 30 years ago. Having bees who can survive on their own is the first. They might not give you a big honey crop but the survivability rate will save your money. Then there are those who are selected for productivity. The correlations between those traits might not be what beekeepers of today want to have. Local adapted bees coming from foreign stock will probably give a good harvest after some years. No matter which race you start with, but I believe, those races, which are not bred for your climate, will need more time to adapt to all the circumstances and will need some generations of descendants to achieve this. Since beekeepers don´t give them this time, wanting a result immediately, the results and claims don´t mirror the reality. In my eyes, if you introduce queens from a northern climate zone, you will likely have more success than introducing the southern stock. But in the end, who ever tested this under natural circumstances? Honeybees are used as livestock from the keeper`s start of using them and nobody ever tested races shifted from their natural habitat to livestock habitat and compared this, if we see “livestock” bees as “natural bees”. So, in the end, we are ignorant of how the races would perform under natural circumstances. And the result of this is, we really don´t know how the races perform under our artificial managing methods compared with their real character. We don´t let them because we bred them to out advantage. Glad to see there are beekeepers that get going in thinking through my postings! Yes, there are many angels here. My observation point is in a northern climate, with experiences from here. For the record I imported breeding material from Africa (very southern, but high altitude). Bees had no winters there but could handle cold and fly at low temperatures. Those bees were also low in swarming, contrary to bees from the lowlands (scutellata). It took about 5-6 years to get the stock with quite high percentage of Monticola heritage to stop making brood in winter. It took some more years so they didn’t get fooled by the sunlight on the snow to come out of the hive. Today the stock winter better than the Buckfast I had before I started to make a combination bee with the Monticola. The important thing here is to have stock good enough with the traits wanted and make selection for the wanted traits in the combination work and identify the least good colonies and replace the queens in those. So in your selection work which traits do you go for? That’s a good thing to make clear. And do you have enough colonies to make progress? Well in a way you don’t consider that because if you want better bees you go for selection even if you only have a few colonies. You need at least two colonies to be able to make selection. To evaluate a queen or a race or the hybrids I believe very difficult. That, first because of nature`s impact. Flow can be good but weather is unpredictable. Matings can go wrong or the queen can be not prolific. Second the man made impact. Drifting of mites from migrating beekeepers, spraying, harvesting with killing many foragers, beekeepers managements which weaken a hive. So without some years of keeping records of your hives you must rely on survivability in winter, not crashing with a mite load, brood brakes, brood productivity and so on. With integrated pest managements like treating with thymol for example or the taking out of brood combs, it could be even need a longer time, but you might have less losses. 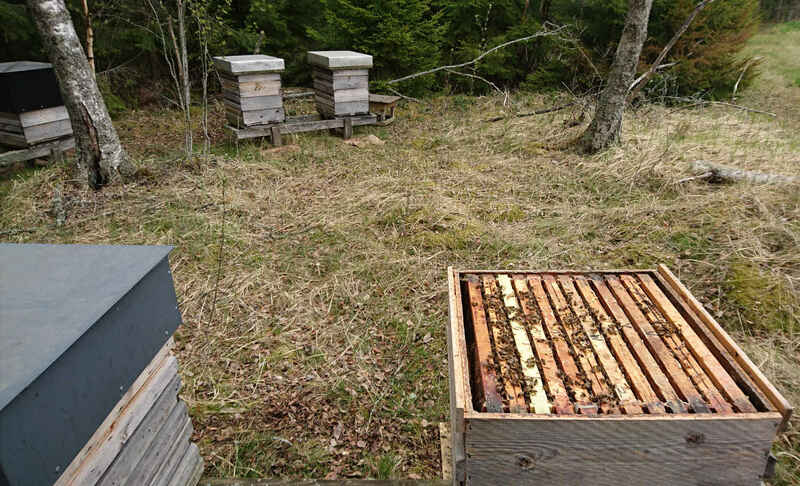 Honey productivity and gentleness are luxury traits you might get as sideline advantage, but since this traits are very important to most beekeepers, yes, most important, it´s really hard to develop a resistant line which stays resistant without the bees being isolated. Work on that will never stop but will become hopefully a little easier after years. Yes, you need an enough isolated place, not totally isolated, to develop a resistant line/stock. It seems though that if the bees, not only a queen bred from resistant bees (since a number of years without chemicals, how many I don’t know, maybe 5 to start such a discussion), but queen plus a nuc/split/swarm can stay resistant even in an environment where the colony will pick up mites from colonies with higher varroa level in the neighbourhood. In spite of that they can stay resistant. That is they rid themselves of mites, grooming effectively, besides cleaning infested brood. There are such experiences for example in Munich. But if hey stay that way after supersedure on that place I don’t know. Maybe new queens must be mated on enough isolated places. There will be a break even point somewhere how big apiary (apiaries) you need and the drone pressure from other neighbour colonies.